Hey all, if you have been following my instagram last month, you would know that I had a vacation in Korea. I posted a picture of KOREAN BBQ (Click HERE to view) and guess what? That very restaurant I went to when I was in Seoul, is actually found in MALAYSIA too. Haha. Such a coincidence right? 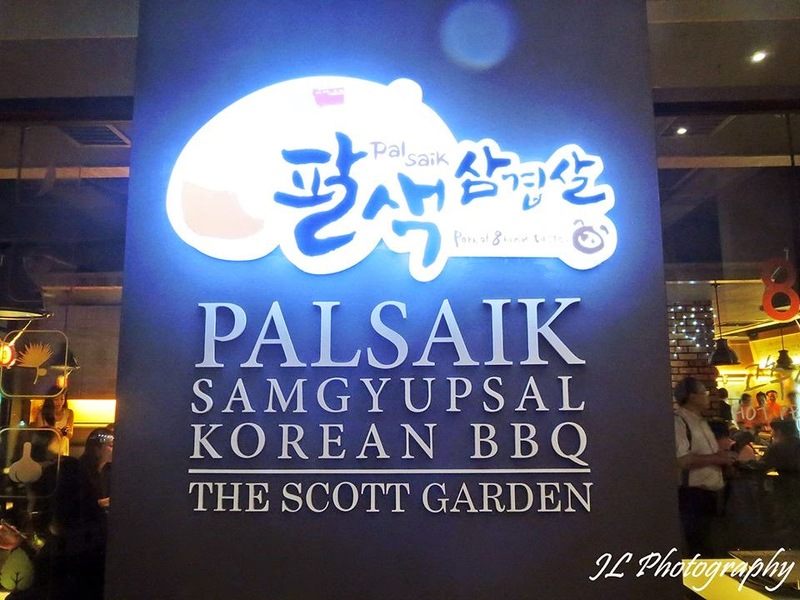 FYI Palsaik is known for their 8 Flavours Samgyupsal (pork belly/bacon). The 8 flavours include wine, ginseng, garlic, soybean, herb, hot pepper, pine and curry. Was invited to Palsaik at Scott Garden two weeks ago for their first year anniversary in Malaysia. Still can't believe that I missed out on them for a year but at least I could compare both of their outlets in Malaysia and in Korea. It was the day I submitted my thesis, so do excuse how I look. heh. Anyways since I finished the dreaded thesis that I have been worrying about for months, it was time to let loose. I decided to try out Korean Alcohol. I had soju with my friends last time, so I thought to try the other drinks they offer in a typical Korean BBQ place. If you're thinking to grab something light and refreshing, I would highly recommend the Rice Wine. But you want to enjoy and have a little kick in your drink then, Raspberry Wine would be for you. And if you're thinking for something a little stronger, order the Plum Wine. But of course, if you want to drink to forget, SOJU it is for you. My favourite was the Raspberry Wine. It was sweet and just right for my alcohol tolerance. It was surprising to see that their pricing is the same as their Korea Outlet pricing. We all got to try the premium set, which contains 8 different ingredients pork belly, seafood soup, refillable vegetables and grilled deodeok (lanceolate) root and premium kimchi. Let me warn you that if you are a group of 4 girls, I would recommend you having the set with two bowls of rice only. There was a lot of meat and we were stuff at the end of the event. Sauces and vegetables were serve first. Tho we ate a lot, I felt healthy and not that guilty. Why? I had more vegetables during this time as compare to my entire month of Vege intake. that is usually a great combination with your samgyeopsal! FYI I usually have 4 refills of this. FYI the free refillable are only applicable to the leaves. Like I said, you would be digesting lots of vegetables. There is crabs, squid, clams, tofu, prawns and etc. The sad thing is, Korea's outlet serves octopus in the soup and Palsaik Malaysia don't. You can ask for free refill for the soup if you finish yours. The soup was sourish spicy. It's a little spicy for me but most of my friends totally enjoyed it and you can really taste all of the seafood in the soup! They use radish to oil up the pan and to removed burned meat. The mouthwatering 8 flavours of Pork! The server start by adding on kimchi, mushroom and chilis to the BBQ plates before the meat! Just look at those glorious meat! If you're worry that you may burn your meat, fret not. The waiters there would do it for you! Just beware of the smoke and a little splatter of the oil. I won't recommend wearing thick clothes because you may get a little hot. It is BBQ after all. There is also normal kimchi served on the pan. This kimchi has been fermented for a long time. Longer than the usual, hence it's premium kimchi. I'm not a fan of it. I kinda love my kimchi fresh and this premium kimchi was too tangy for me. At that night, I thought this was ginseng. Silly right? Anyways I googled it and it's Lanceolate Root. It taste like meat actually and it wasn't spicy. I actually liked it. I tried it raw also, it was surprisingly good. So I guess you could opt for raw if you dare. You could also call for add ons onto your set. We had mushrooms and cheese fried rice for extras! The cheese stir fried rice was cooked on our seafood soup pot. It was really filling and so good. Thinking back of it s making me drool. There was an abundance of octopus found in it! If only this was serve in Palsaik, definitely one of the best korean pancakes I had so far. Thank you Elana for the invite! And thank you Palsaik for the wonderful food. Shall blog about the Palsaik Korea Outlet soon. For now, I shall highlight the difference of Malaysia and Korea outlet. Be careful when you go to Scott Garden at night, I do find it a little dodgy. FYI I have been to Palsaik after the first year anniversary with my uni friends and can't wait to bring my family. Feel like this place is a wonderful place to catch up with friends and families. 2-15 & 2-16, The Scott Garden, 289 Jalan Kelang Lama, 58000 KL.